Please allow extra time for special color requests. A rustic looking basket with beautiful variet of colored flowers. Great for any time of year. This simple basket of bright and cheery flowers would be a delightful addition to any get-together, office or work place. A Dish Garden is a cheerful way to say" We're thinking of you today". It brings a garden indoors for that person who likes plants. Ooh la la luscious! Declare your love with style - send her gorgeous roses and lilies set off with a red-hot satin ribbon. She'll be thrilled with this gorgeous gift. 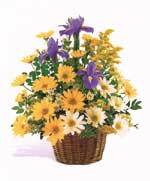 A wicker basket made up with a garden style arrangement of mixed flowers.